Happy Holidays to all our friends in America! 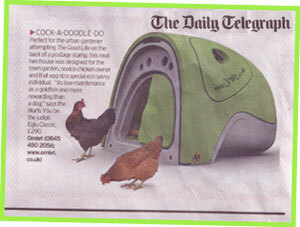 We’ve got some great news for you…the Eglu Cube is now in stock and ready for immediate despatch. Order now and you will have it in 7 to 10 days, so you will receive it in plenty of time for Christmas. The Cube would make a fabulous present for someone this Christmas, or if it’s you that wants to find one under the tree, why not forward this email on to your parents, friends or other half? We had a brilliant response to our latest competition to win a Qute. It appears that it really is fast becoming the must-have hamster house this season. Now, for the results… our lucky winners are Michelle Fuller and Jane Jeffery. Michelle posted a photo of her current hamster cage which is covered in tape to try and stop it falling apart. We couldn’t bear the thought of Lucy the hamster having to live in such a shabby house and we can’t wait to see what she thinks of her swanky new pad! Our second winner, Jane, is already a big Omlet fan, with one Guinea Pig Eglu and Two Eglu Cubes already. She wanted to the win the Qute for the hamster rehomed by her father, who suffers from Alzeimer’s. Qute is an ideal home for Jack hamster as it gives a great view of what the little chap is up to. We couldn’t go without mentioning the entry from Iona Powell though. Her inspired poetry has been chosen as our highly commended entry and you can read it by clicking here!